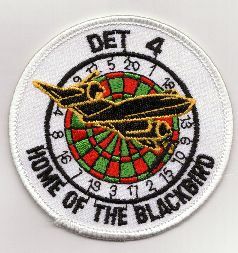 SR-71 Reconnaissance Operations at RAF Mildenhall was from April 1976 to 1990. Prior to Det 4 being established, UK permission was required for each sortie flown. The SR's stay was to be no longer than 20 days for each visit. On 05 April of 1982 Prime Minister Margaret Thatcher announced that Det 4 would be a permanent SR-71 Detachment with two aircraft assigned. The United Kingdom remained in control of the more sensitive missions. The two aircraft Detachment ceased operations on 22 November 1989. The last aircraft departed the UK on 18 January 1990. The U.S. Government has given the United Kingdom an SR-71 #962 for public display at Duxford Imperial War Museum for it's contribution to ending the Cold War. 1986 Muammar al-Qadhafi: In the early 1980's Qadhafi had decided to increase pressure on the West through subsidizing terrorism. In 1986 Qadhafi, who was maintaining some 22 terrorist camps in Libya, responded to the increased US presence off Libya by announcing a 'line of death' enclosing the Gulf of Sirte. In addition to other Libyan terrorist acts, on 5 April 1986, the La Belle discotheque in Berlin was blown up and a US serviceman was killed. There was evidence of Libyan complicity and the US Government decided to act "in exercise of the inherent right of self-defense recognized in article 51 of the Charter of the United Nations". Thus operation "El Dorado Canyon" was launched in retaliation for Qadhafi's terrorist activities. RC-135Ws and a sole RC-135V (6414842) flew through, presumably bound for Hellenikon AB, Greece, and the 922 Support Squadron. These aircraft, together with EP-3Es and ERA-3Bs of VQ-2 at Rota, Spain, were to pursue intelligence gathering and control functions. The U-2Rs of Det 3, 9 SRS, 99 SRW at RAF Akrotiri on Cyprus were supplemented by several TR-1As from 95 RS, 17 RW from RAF Alconbury and together with SR-71A's of Det 4 of 9th SRW at Mildenhall were engaged in the reconnaissance of possible target areas in Libya. Three HH-53C rescue helicopters from 67 ARRS at RAF Woodbridge set off for Naples, followed shortly by two HC-130N Hercules from the same unit. It had been decided to mount an attack on Libyan military and terrorist targets, in an operation named "El Dorado Canyon". 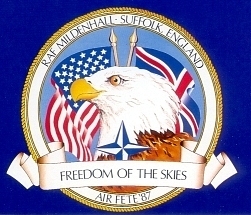 Mildenhall (sixteen aircraft) between 11 and 13 April. RAF Fairford also hosted fourteen KC-135s, mainly the -A variant, and Mildenhall was home to twenty of the type including at least six KC-135Q variants. At Lakenheath, 24 F-111Fs of 48 TFW were also preparing to depart on what was to be a 14 hour, 5,500 mile round trip, France and Spain having denied the US overflying rights. returned to their base after first refueling in the Bay of Biscay some time after 1940 hrs. The aircraft came from all four 48 TAW squadrons with seven each from 492 and 493 TFS and five each from 494 and 495 TFS. Weapons included 500lb Mk82 bombs and GBU-10 LGBs. Also involved in the USAF attack force were five EF-111As of 42 ECS, 20 TFW, from RAF Upper Heyford. Of the five, two were standby aircraft, one of which returned to base after refueling once while the second reportedly completed the trip. However, the first aircraft to depart on operations was KC-10A 830080 of 22 ARW which left Fairford at 1813hrs, quickly followed by six more plus two KC-135s. The KC-135s were to top up the KC-10s and return while the larger aircraft continued south in support of the EF-111s. Tanker support for the main strike force, in the form of ten KC-10s and six KC-135Q's departed Mildenhall from 18:15 hrs. The plan was for a joint USAF/USN attack. 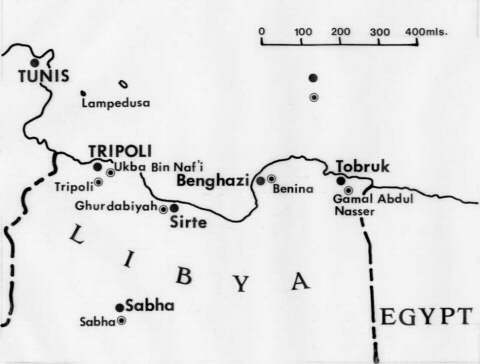 The specific targets for the UK based USAF element were the military side of Tripoli Airport (occupied by the Il-76 'Candids' used to transport terrorists and their equipment around the world, often under diplomatic cover), the Al Azziziyah Barracks - a control and command center and Qadhafi's home - and Sidi Bilal, a training area which included a terrorist marine sabotage camp. The Sixth Fleet's targets in the eastern zone were the Al Jamahiriyah Barracks - an alternative to Al Azziziyah - and Benina Air base. Precise co-ordination was not of paramount importance, but is is understood that an EC-135H acted as a tactical command center. Airborne early warning for the F-111F force was provided by an E-3A of 960 AWCS and for the naval aircraft by E-2Cs of VAW-123 and -127. EA-3Bs of VQ-2 from Rota were also involved with F-14A cover; all of these command and warning aircraft were on station by about 2230 hrs. As the F-111 force approached Libya after a total of four air refueling, the naval aircraft began taking off. launched six A-7Es of VA-46 and VA-72 equipped with AGM-88A HARM and AGM-45 Shrike anti radiation missiles for defense suppression, six A-6Es of VA-34 and a single EA-6B of VAQ-135. 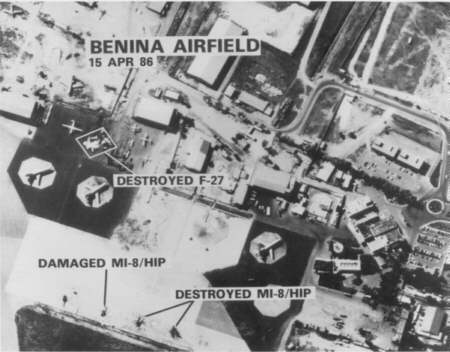 The force from Coral Sea, with its EA-6B electronic countermeasures (ECM) support, attacked the airfield at Benina after AGM-88A HARM-equipped F/A-18As and America's A-7Es had attacked air defense radars. The A-6Es used their Norden AN/APQ-148 multi-mode search radars to acquire their targets, with data transfer to the AN/AAS-33 Target Recognition Attack Multisensor (TRAM) system for weapon release. At least four MiG-23s were destroyed and many more damaged in the airfield strike: also destroyed were two Fokker F-27s (5A-DLP and -DLY) and two Mi-8 helicopters. Meanwhile, the A-6Es from America attacked Al Jamahiriyah Barracks, causing much damage. Both the airfield and barracks attacks were made at midnight, reportedly using 500lb and 750lb bombs, although the A-6E is equipped to use both the 500lb Snakeye retarded delivery and CBU Rockeye Mk 20 cluster bomb. By 0013hrs on the 15th all naval aircraft reported returning and all had recovered by 0153hrs. Two of the A-6Es launched aborted for unspecified reasons. Meanwhile the F-111Fs had crossed the Libyan coast under the protection of the EF-111As to the west of Tripoli; the latter had started jamming at 2354hrs. They split into two groups approaching the targets at 200ft and 400 knots from the south. At midnight one group, by now comprising only eight out of the intended twelve aircraft, attacked Qadhafi's headquarters at Al Azziziyah Barracks and the Sidi Bilal training camp. GBU-10 Mk 84 2,000lb Paveway II bombs. Despite the normal efficiency of the equipment, there was considerable collateral damage south of the barracks to the embassies of Austria, Finland, France, Iran and Switzerland. The US claimed that the damage was caused by spent SAM boosters, but subsequently admitted a degree of responsibility. 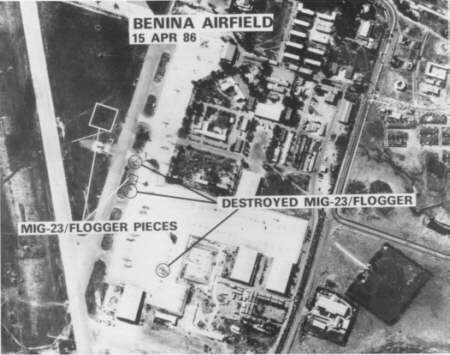 The second group, of five aircraft, attacked the military side of Tripoli Airport with Mk 82 500lb Snakeye retarded bombs, resulting in six Il-76s, a Boeing 727 and G.222 destroyed. Other, smaller, aircraft lost included two Twin Otters (5A-DCS and -DDC), two Cessna 402s and two Cessna 152s. The Soviet controlled airfield at Ukba ibn Naf'i was carefully avoided. 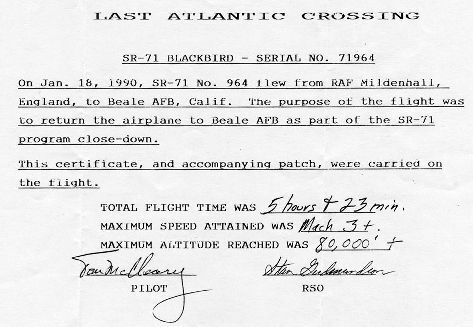 Shortly after the attack, at 0010hrs, F-111F 702389 of 494 TFS hit the sea 20 miles north of Tripoli. From the lack of radio transmissions it is assumed that the aircraft was not hit by anti-aircraft weapons; crew members Major Fernando L Ribas-Dominicci and Capt Paul F Laurence were killed, the only US casualties of the entire operation. At about 0315hrs a returning F-111F diverted to Rota AB in Spain with an overheating engine; it returned to the UK on 16 April. After more refuelings the F-111 bombers and their tanker support started landing at their UK home bases of Lakenheath, Fairford and Mildenhall from 0545hrs. 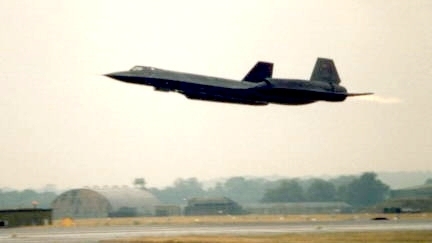 Before the first aircraft touched down, however, two SR-71As took off from Mildenhall for post strike reconnaissance, having been preceded by the customary train of KC-135Qs carrying JP-7 fuel. On their return the C-135C of 4950 TW flew off for Washington with evidence of the damage. The KC-10s and KC-135s also began the return trip to the United States from 15 April. Technically Operation El Dorado Canyon must be judged a qualified success, especially with no apparent loss of US aircraft to Libyan defenses. However, five of the F-111F force of eighteen aborted as did two of the A-6Es. There was, moreover, considerable collateral damage within half a mile of the Tripoli target. 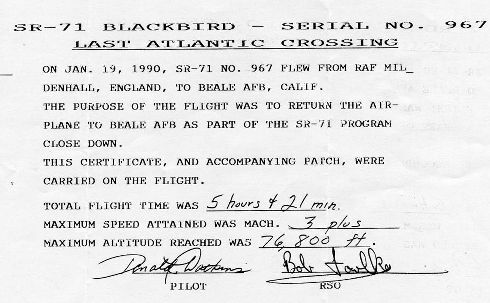 Page #48 of "SR-71 Blackbirds"